The cordon surrounding the burnt-out Primark building in Belfast has been further reduced, with the reopening of the footpath from the corner of Donegall Place to the corner of Fountain Street this morning. It followed a reduction in February when pedestrians were allowed to walk between Castle Street and Fountain Street. See link below. Commenting on the further opening of the Primark cordon, Retail NI Chief Executive Glyn Roberts said: “This is welcome progress which will enable the last few traders in the area to reopen their businesses and reconnect Castle Street traders with Donegall Place. 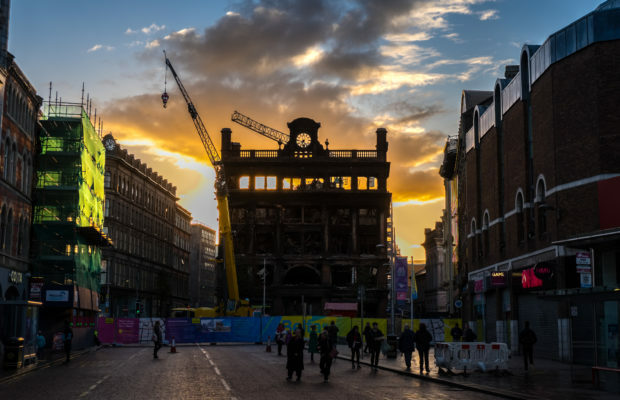 “While this is a step forward, a huge amount of work is still needed to fully rejuvenate that part of the city centre impacted by the Primark fire. This whole crisis has shown just how resilient city centre traders really are. Belfast City Centre has a fantastic retail and hospitality offer, which we need to build upon in the months and years ahead.